Aksium Elite is the next evolution of the Aksium wheel system, updated to reinforce its sporting abilities on any kind of ride, while adding the benefits of our Wheel-Tire System. To achieve this, we leveled up the rim design with a wider 17mm internal rim for improved ride quality. We also included a sleeved joint, which removes the need for the pin channel that runs through the entire rim profile of a pin joint rim. 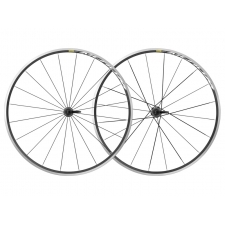 A sleeve makes a solid connection between the two rim ends instead of the two pins and the result is an impressive 40g weight saving per rim: close to 10% less rim weight! Although more expensive, this process is key to making the Aksium more dynamic, making it easier to spin, to steer and to climb with. 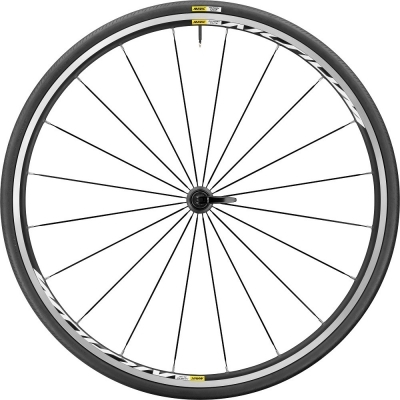 Of course, as a signature Mavic wheel, we still use straight pull bladed spokes for improved stiffness and strength. And the hubs are still running on our QRM bearings and axle system, which is the key to Aksium’s smoothness and durability. Over the years, Aksium Elite has always been a popular choice for racers in training. As such, we’ve matched it with the safest possible tires giving you the peace of mind that’s essential to any training ride. The Yksion Elite Guard road tire that comes with the Aksium Elite features the same 120TPI casing, rubber compound and tread pattern as the Yksion Elite. Those two elements are key for the low rolling resistance and all-round grip and traction that are needed on a winter training ride. But they also feature a strong nylon anti-puncture breaker that runs from one bead to the other, to protect not only the rolling tread but also the sidewalls from punctures and side cuts. 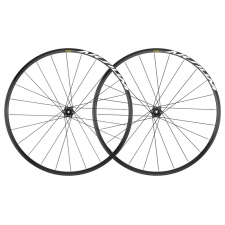 At 230g in 25mm section, they are among the lightest all season tires – perfectly complimenting the lighter rim and reinforcing the wheel dynamics. A 28mm section is also available at 245g. 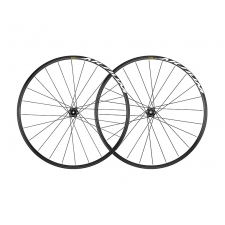 Buy your Mavic Aksium Elite Wheelset from Revel Outdoors.